You may not be looking for new opportunities at the moment, but at some time in your future career you will use it. CV writing in English can be a bit tricky when you don’t keep it up-to-date on a regular basis. Reflecting now on the last 12 months and your successes, while things are still fresh in your memory, will mean your CV is ready when you need it, detailed and with all the important information to make a great impression. When writing about your responsibilities and achievements, start each sentence with a dynamic verb. These show action and progress over a period of time, and will give the reader the impression of things being done. Managing a team of 10 engineers based in Romania and Slovakia. Developing state of the art software for scanning equipment used at Heidelberg training hospital’s head trauma clinic. Negotiated contractual deadlines with customers. Organized supply and delivery of system components. You can make your CV stand out amongst other by using dynamic language. Take a look at your CV and make some changes to help you get that dream job you have been looking for! Let us know of any specifics questions on writing well when updating your CV in the comments area below. What kind of parental leave questions in English can you expect from your company’s employees? Working in HR and answering employee’s questions can often be difficult, especially when you are dealing with people’s personal lives and their impact on work. This definitely is the case when it comes to time off due to a new baby being born, or what is known as ‘maternity'(mother) or ‘paternity(father) leave’. Below are some common parental leave questions in English. The answers may be dependent on your company regulations, but a lot of these are also subject to German laws. It may be a good idea to practice by taking the questions in turns with one person being the employee and one the HR consultant. This could help your department be better prepared and avoid any difficult situations that may arise. What is the earliest date I can start my maternity leave and the earliest I can finish it? What do I need to do with regards to informing work if my baby comes early or late? Can I extend my parental leave unpaid? What do I need to do? Can I work from home during my maternity leave? Why / Why not? Can I take temporary work somewhere else during my parental leave and do I need to inform the company if I do? What rights does my live-in partner have if he/ she are not the biological parent of the child? What options do I have if I want to work in a temporary position while I am on parental leave? If I work in a temporary different position during my parental leave, is it easy to get my old job back? What is my maternity allowance and is there a maximum rate? Am I entitled to maternity allowance if I am a trainee / a 6 month intern / started work 6 months ago? Do I have to come back to work full-time if that was how I was originally employed? What is the procedure for going part-time? Can both my husband and I apply for parental benefit? What is the situation with parental benefit and having children in preschool or school? What other benefits might I be entitled to during my maternity / parental leave? Let us know if you can think of any other parental leave questions that have come up, or suggestions on answers, in the comments area below. Also, make sure to check out interviewing seminar specifically designed for HR professionals by clicking here. What would you say are the best steps to take in this career path? What interested you most about this industry and your company? What would you do differently if you were starting over today? What do you see as possible next steps for you? What career expectations do you have in the short and long term? What are you most excited or concerned about regarding this industry/company/career path in the future? What would you do if you were looking for a job tomorrow? What do you do in a typical day or week? How much time are you in meetings, on telecons, traveling, etc.? What would you do differently if you were in charge of your company? What do you see as the biggest competitive challenge for your company? What have been your biggest surprises in this area of work? What motivates you to continue on in this company/industry? What worries you about this company/industry? What challenges are there regarding hiring practices in this company/industry? Can you recommend others I can talk to about this field? What skills have been most critical to your success? What weaknesses in a person’s skill set would make him or her struggle in this company/industry? What are the most valuable skills in your job? Which experiences enabled you to develop these skills? How do you keep your skills current? What type of training seminars do you attend? What do you read? What professional associations do you belong to? Informational interviews can be a great tool in helping you plan your next career move, and establish a clear and focused career path. 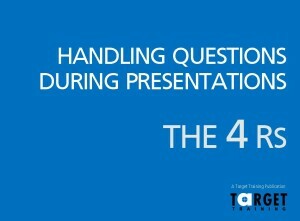 Make sure to check out Target Training’s seminar on interviews as well. What other good questions or tips have worked well for you? Let us know in the comments section below.